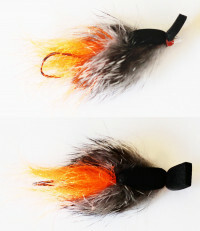 Great Salmon egg colors and rabbit fur. 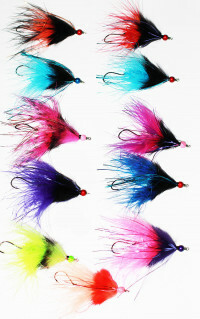 Good for winter and spring Steelhead and Salmon. 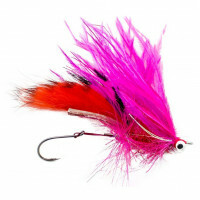 Max Canyon Fly with it's dark profile with a bright tag and tail is a very effective and famous summer Steelhead pattern. Named after Max Canyon on the Deschutes River in Oregon. Skating white flies on the surface heats up the action. Tied with Ostrich and Lady Amherst. 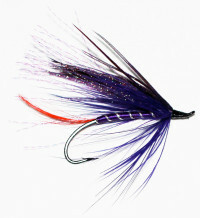 This fly is easy to cast and gets down deep. 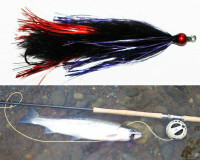 shank-style fly with trailing bait style hook for solid hook-ups. 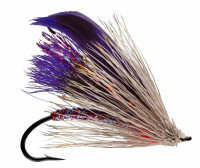 Ostrich Flash Bucktail Steelhead Fly - tied using Ostich Plumes rather that bucktail. This gives the fly more action. 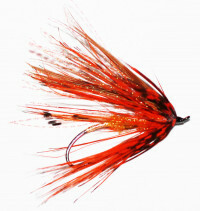 Tied on a size 3, Alec Jackson Spey Fly Hook. 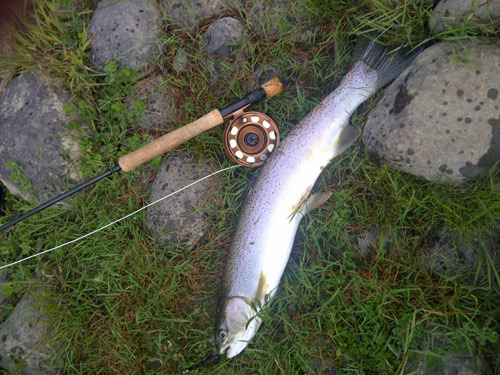 Excellent summer and fall pattern, or when water flows and clarity allow. 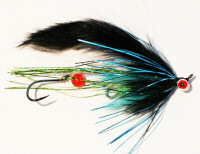 Easy to cast marabou fly. Good summer and fall searching pattern. 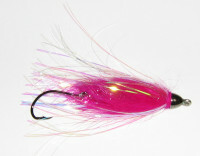 The Hybrid, A very serious Steelhead Fly (Solid colors good for Salmon too). 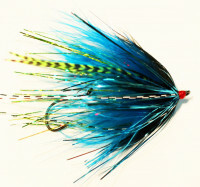 I have designed similar Steelhead flies like this pattern. It is a refinement. The Hybrid also comes articulated (more movement) if you choose that option. 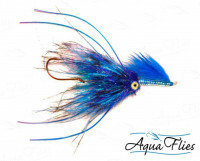 Also this pattern comes with the new tip dyed Ostrich Plumes that really add movement, plus with the added Ostrich Spey Plumes tied in under the larger tip dyed plumes gives the fly more silhouette but without much water absorption so it is pretty easy to cast for a big fly. 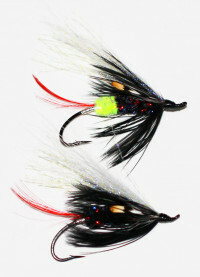 When the black dyed tips of the Ostrich move the fly appears more lively in the water. 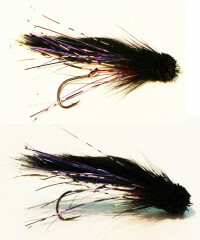 Use Purple and Pink if Black and Purple aren't producing. 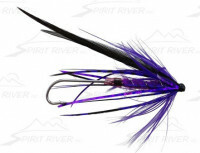 The VooDoo Leech is articulated so it is able to be long and bulky, but will swim in a lifelike manner, and the hook will stay firmly planted in the jaw of your fish. 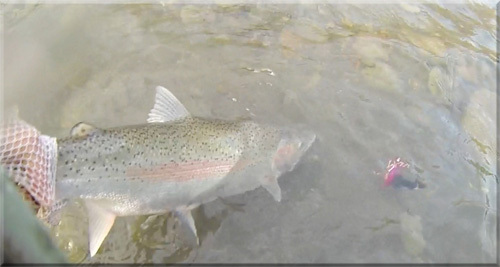 Countless times I have seen Steelhead rise up and take white cotton ball seeds (from Cotton Woods) or white Dandelion puff ball seeds. Something about white skating across the water surface that moves them. Tied on a size 6 hook. 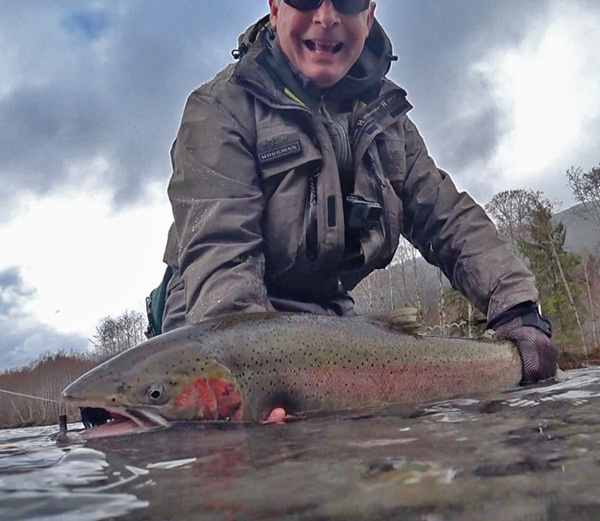 Rob Crandall lives in Portland, Oregon, where he operates Water Time Outfitters, which offers guided fishing trips on the Deschutes River for trout and steelhead, as well as guided fly fishing for steelhead on the Clackamas, NF Nehalem, Trask and Oregon Coast rivers in the winter. 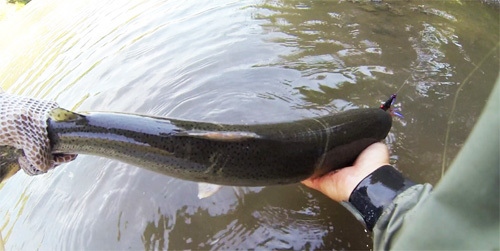 It is on these rivers that Rob designed and developed his fish-catching patterns. 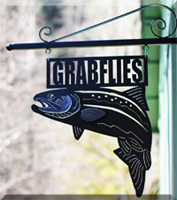 He grew up on the banks of the Clackamas River and has been a licensed Oregon fishing guide since 1992. 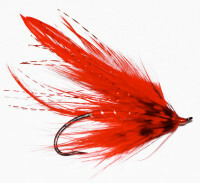 Rob is also the past editor of Flyfishing & Tying Journal magazine. 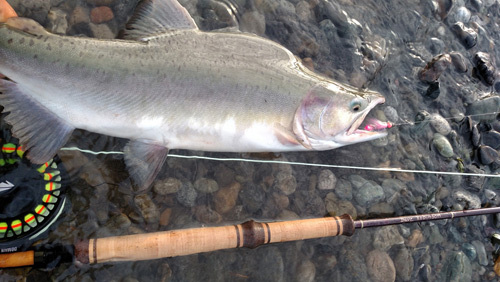 A great time tested and proven Steelhead pattern. 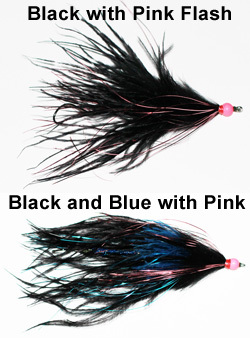 Black and blue is money for Steelhead. 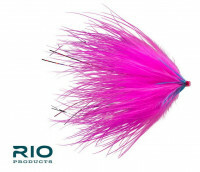 HoBo has lots of movement in soft water because of the Marabou. 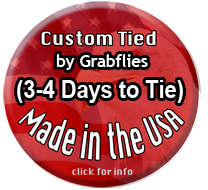 Grabflies ties this pattern with a dubbing ball before Intruder Prop hackle and then black Marabou. 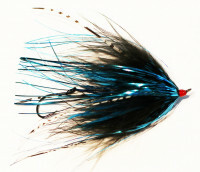 This stops the Marabou from collapsing flat, but instead gives the fly shape and movement. 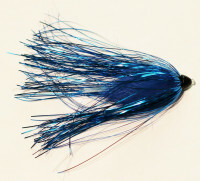 The Evo Bunny Supreme is weighted enough to get the rabbit down - swims great. 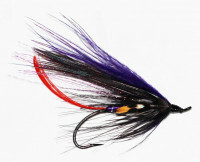 The fly is tied with weighted wire (.025 - .030). 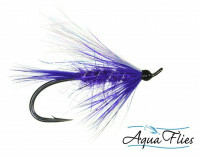 This is used to create an enlarged body that helps keep the rabbit wing swimming higher and off the hook to help prevent fouling - see photo. I've been working a long time playing with methods to do this. Here it is!